Rodama: a blog of 18th century & Revolutionary French trivia: Stop press: Robespierre reconstructed! What do you know?! Robespierre and his death mask have made the headlines! 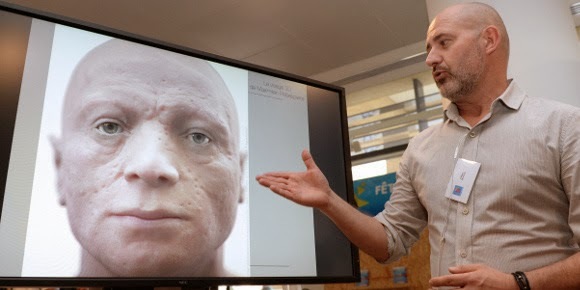 Mulhouse-based facial reconstruction expert, Philippe Froesch used advanced FBI techniques to create this image from a plaster copy of the Tussaud mask, now in the Museum of Natural History in Aix-en-Provence. I'd say the features look superficially convincing, especially in profile, but somehow - and Maximilien's many fans will no doubt agree - it doesn't quite satisfy the imagination. Monsieur Froesch himself professed surprise at the harshness of the result - possibly he has overdone the poxy complexion and those tiny icy eyes don't seem right. 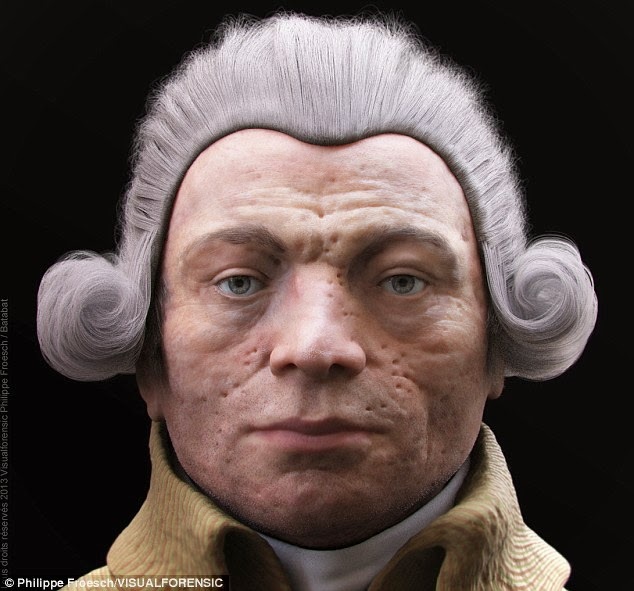 (Were Robespierre's eyes actually blue? In some portraits they are brown.) Robespierre is often described as dapper in appearance and feline in his movements, and not the sort of person to stand out in a crowd. I'm not sure this is quite that person. It is certainly hard to see here a man who was attractive to women. We used a hand-held scanner to obtain a 3-D image that we had to adapt to take account of all the details — the scars, the spots, everything,” said the specialist, who worked with Philippe Charlier, a renowned forensic scientist. He faced a difficulty with the eyes, because the mask had them closed and the eyelids had been drawn by hand in the wrong place. Mr Froesch used techniques invented by the FBI to place the eyes correctly in relation to marks left by the corneas in Grosholtz’s mask. He said the result was a “worrying face” — in keeping with Robespierre’s infamous reputation, and far harsher than contemporary portraits of him. “The portraits made him look quite gentle, probably because the painters knew about his temper and wanted to be careful,” he said. 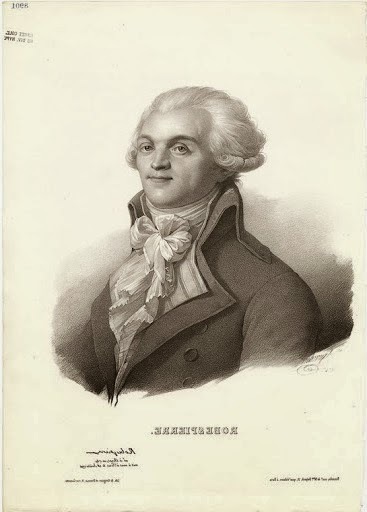 “The true Robespierre had 100 or so pockmarks, bags under the eyes and a nose in the form of an inverted V. He was pale, tired and he had a lot of nosebleeds. It is interesting to note the existence of this copy of the Tussaud "death mask" in the Musée Granet in Aix-en-Provence: apparently a number of copies were made on the instructions of Pierre Marie Alexandre Dumoutier, who founded the Society of Phrenology of Paris in the 1830s, including one which preserved in the collections of the Musée de l'homme in Paris. Thank you for the reference. This all seems plausible - Robespierre's bouts of illness are pretty well documented. Interesting to have the extra pictures too. The reconstructions here seem a bit more nuanced than the "mug-shot" view that was widely published. Also informative to have a photo of the original plaster mask. He certainly looks more pockmarked from this than I had appreciated from pictures of other examples like the one in the Hutton Collection or the one in the Carnavalet which is (I think) a bronze. Yes, I remember, you wrote about his death mask. Pockmarks seem odd nowadays, but they must have been a very common sight before vaccination was possible. We're not used to the sight of defacing scars etc. any more. Having looked at the photographs which show the shape of the nose in profile or near profile… I think I can say fairly confidently, that is not him. It's a very fine life-mask and excellent reconstruction of an interesting-looking sitter… Just not of Robespierre. The physionotrace is key. The method used to draw a physionotrace gives the sitter's profile from life. The shape of the nose is not the same at all. For the same reason, the pastel-tinted anonymous physionotrace used by Scurr and Martin on their biographies is not him.